ePortfolios in the Upper Primary Classroom? Recently, I’ve been reading about ePortfolios … e-portfolios …. and even Eportfolios (not sure which one to use!) Anyway, when I first heard the term I looked it up and immediately thought that the concept would be great to use when giving children their own online space. I’ve been introducing teachers here to class blogging … but after a time, they tend to ask me how they can give the children their own space. I can understand this – it’s exactly what led me to giving the children in my own class a page in a class wiki – then eventually their own wiki, and their own blog. The next question I’m asked is always…. ‘So – how should the pupils use the space?’ After more than two years of giving children their own online spaces, you’d think I’d have been able to answer that question straight away – but I always hesitate. I’ll attempt to reflect here on why that was. The first attempt at giving the children an on-line space was via a page on a class wiki. There were four wikis, actually – one for each type of writing. The children either wrote class work directly on to the wiki or, if they didn’t have the typing skills, they would put on a short section of whatever they had hand written. They also had a space on our topic wiki, and they learned how to upload pictures, slideshares, videos, etc. There were even maths group problem solving spaces where they wrote about on what they’d been doing in class …. 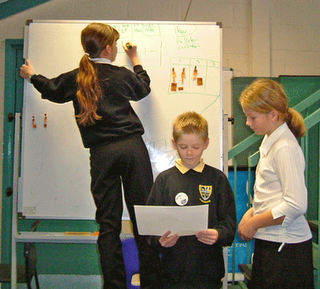 and early attempts at making group podcasts to say how they’d solved some maths problems. At some point the children were given their own blogs where they wrote about school related items. What happened after that was just great! The children began to use their blogs for reflection – what they wanted to do when they were older, worries – and hopes – for High School, thoughts about family life, hobbies, etc. etc. They were also keen for the blog posts to be read out to their classmates, and this led to inspiring others to go home and write their own post. I’ve written a few blog posts in the past about the positive impact of giving the children more ownership over their blogs. So why the hesitation in recommending that other class teachers leave children to their own devices? Well, on reflection, it may have worked so successfully for me because the children were actually very well aware of the fact that their use of their online spaces was going to be used in the case study I was writing up for my Chartered Teacher course. Because I was going to be quoting them in my write up, permissions had to be granted by everyone involved. They were also aware that I was blogging about the whole journey, and a couple of them even left comments on my blog. I’m not sure what would happen if children were just handed these spaces and told to ‘get on with it’ …. would it turn out to be no more that a bebo or myspace type of thing?? ….. not that I think that would be totally wrong, either – but that’s another story 🙂 What I’ve been lookng for, is something in between simply using the space for classwork and a kind of ‘laissez faire’ policy. In general, an ePortfolio is a purposeful collection of information and digital artifacts that demonstrates development or evidences learning outcomes, skills or competencies. The student work included in the portfolio should be that which best tells the story they want to tell – so they need to justify their choice of content. Well there it is! My new recommendation for next session when teachers ask about giving children their own online space. Blogs or wikis?? I’ll suggest wikis – I have recollections of the primary 7’s not liking the fact that their blog posts seem to disappear (archived). Also, on a wiki, the menus at the side and the discussion facility facility on blogs just seem to lend themselves more to the purpose? They can be found on this post and on this other post. Kim’s comment prompted me to investigate that issue more fully. Today in class, the children explained that it wasn’t that they felt unsafe using their blogs, but that they realised the dangers of placing individual photographs on there, or mentioning surnames, etc. These are things they feel that they can do on their Bebo sites because only their chosen friends can view these things. It’s not a case of them feeling uncomfortable with our Individual Blogs, just an awareness of the need to be more vigilant. We’re also about to begin our WW2 topic. Before we do that, we’ll try to get a sense of history by making up good interview questions to ask an older member of the family. Some might choose to note down the responses, some might make a podcast and others have suggested carrying out a telephone interview. Thanks again to my critical friend for helping me to keep focused!